Free to attend – All meals prepared are available to anyone in need throughout the week for £2.50 a person which can either be eaten on site or taken away. We meet every week and young adults who have a range of abilities and I am sure they will not mind me saying, many struggles with skills such as cooking, most often due to a lack of motivation, last week two of the regular members said with a smile “it’s usually that, lazy gene,” often I just can’t be bothered!” Jokey as we most often are, this inability to be able to motivate themselves often causes the biggest problems with all areas of day to day life. I am sure most households would agree that it’s the biggest cause of rows and of long-term frustration. Well, although we cannot solve this, we can at least encourage young adults to come and cook with us once a week and teach them essential cookery skills, safely. We have worked on safe knife skills for weeks and each session starts with a reminder of good hygiene and safety. I hope we at least embed these so that when motivation does strike, they can create an impressive balanced meal, keeping all digits, avoiding scalds and with the kitchen unscathed to boot!! We cook a range of dishes with simple easy to get hold of, larder ingredients and a meal is taken home, with between 8-12 meals being placed in the freezer for those who need feeding. 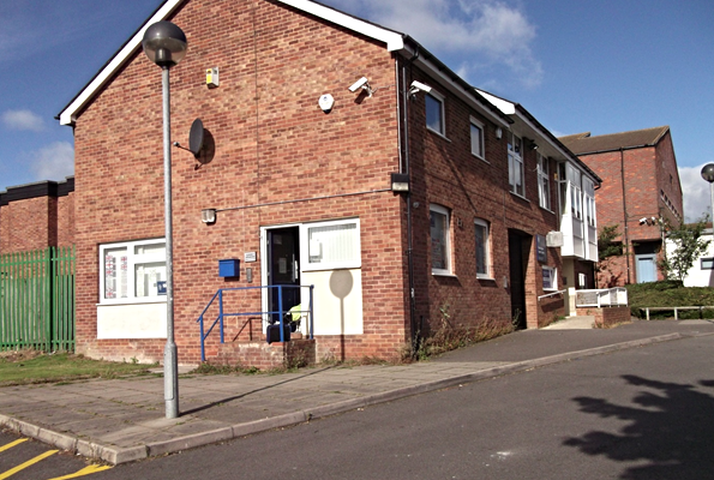 We share this with the Buckingham Youth Club who are also able to make sure those young people or adults who are missing meals, have access to a filling and wholesome meal. 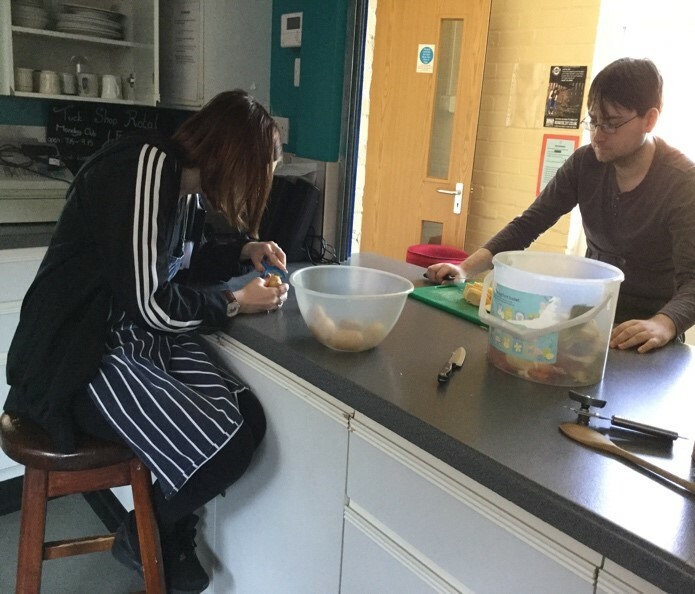 Our weekly cookery club for anyone over sixteen years of age, who struggle with learning or social skills which are needed to enable learning in a classroom or more formal learning environments following more complicated instructions, needed to be able to cook a meal for you and to share with others. The group helps out to feel in control, to be able to remember recipes and the process of cooking a healthy, and welcoming meal which can be shared with family and friends. As trends, beliefs and needs change, so have we. We have Vegan meals available and dairy free or vegetarian meals to suit all those who come to the centre. Come and join us if you are free. We try to make vegetable soup each week, available for anyone who needs it or anyone who wants a hot meal during the week. This is stored in both fridges, one in the Youth Centre and one in Clearly Speaking. Any family needing a hot meal, or who is concerned about children or family members who are not eating regularly, or who are not eating a range of foods, something which is very often a big worry for children and young people on the Autistic Spectrum, please do speak to Janet Nicks, and Clearly will gently support family members to receive gentle discrete support to eat, share time and food as is appropriate. This wonderful club has been running for a year now and we have cooked with and fed over two hundred children and young people. Please can you support us, in any way to have a second year of success? Can you offer a one-off cookery session, a specialist area of cookery for us, Halal, pizza making, Vegan diets, the essential nutrients, Creole cookery etc. 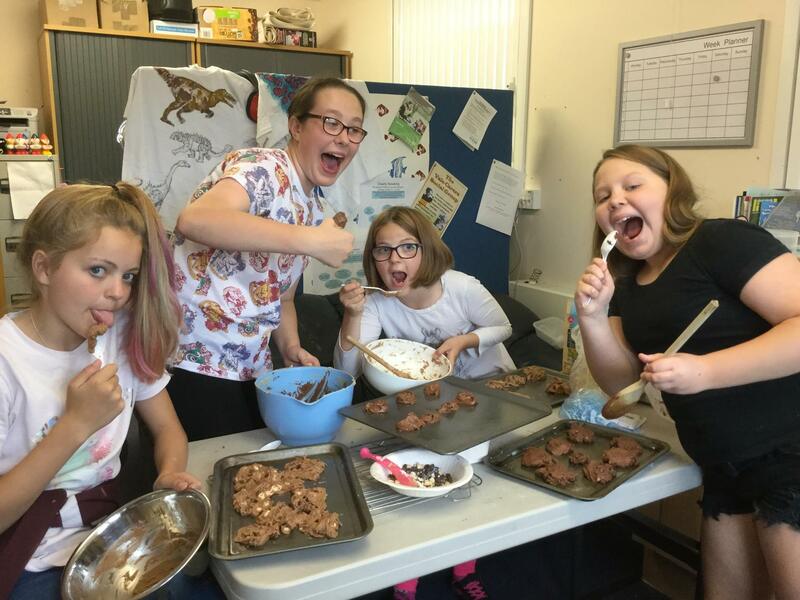 Our cookery club runs on Wednesday’s from 1pm and we make a range of meals which are suitable for all diets and dietary needs, and when discussed and planned with club members and families, we can then also plan and arrange for meals to be as inclusive and safe as possible. Please get in touch on 01280 824871 or come along when you have some time, help out or come and enjoy the session and the company, as well as a hot meal and a chat. Always keep an eye on our Facebook page just in case we have had to close, so far it has been due to the ice, the kitchen being remodelled! And a lack of ingredients to cook! We hope to have a regular source of food to cook with as quickly as is possible thanks to amazing groups who work to ensure that food is no longer wasted.